In September 2011, the Oakland Bicycle and Pedestrian Program launched an annual program to count the number pedestrians and bicyclists at judiciously chosen locations. The purpose is to create consistent data long term on citywide bicycle usage, and provide other useful data on pedestrian volumes. Counts are collected at 36 intersections. For details see intersection map, list, and counts methodology. Oakland is diverse in many ways, including by race, income, topography, land use, and bicycle use. To better understand how to meet the needs of cyclists in different parts of the City, OakDOT's Bicycle and Pedestrian Program analyzed the city as a collection of eight zones, defined largely by topography and neighborhood identity. The analysis examines various topics, including bicycle use, socioeconomics, geography, and infrastructure, that tend to be obscured by citywide averages. 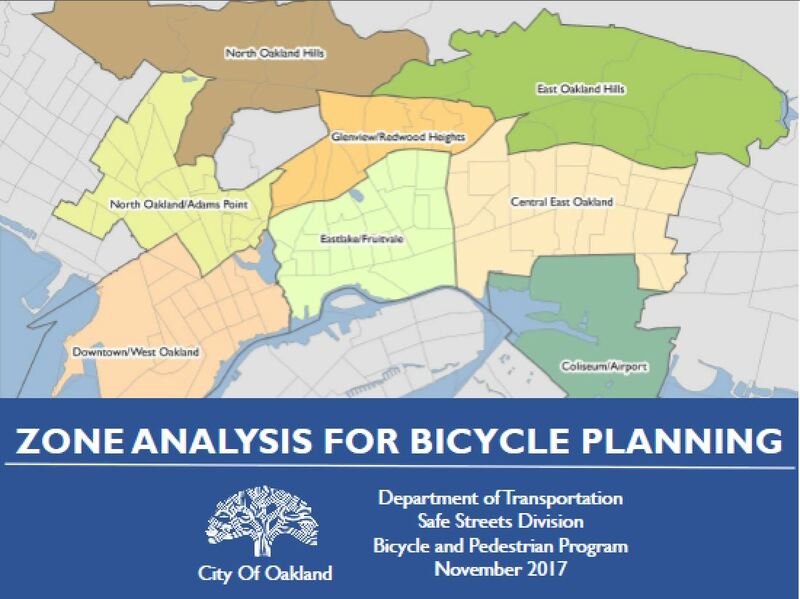 The Zone Analysis for Bikeway Planning, June 2018, helps visualize the differences across Oakland with the goal of tailoring proposals and investment to the needs of different areas.